For terrestrial anti-aircraft defence, there are the same kind of gun-versus-missile arguments as in naval applications, with the additional point that features such as hills, trees and buildings can greatly reduce the range at which low-flying aircraft are detected, giving quick-reacting, gun-based systems an advantage. On the other hand, the increasing range of the anti-armour missiles carried by attack helicopters is taking them beyond effective gun engagement range, with the possible exception of the largest calibres such as the 76mm OTOM AT-IC. The ideal solution is the same as the naval one: combine guns and missiles on one mounting. Once again the Russians are in the lead with the powerful Tunguska, the US Blazer equivalent being much less impressive in terms of both gun and missile effectiveness. Gun calibre escalation is even more acute in surface fire roles, driven by the increasing armour protection of MICVs. The standard US calibre of 25mm is now the smallest being considered for new developments, with 30mm being common and 35mm and even 40mm being offered. 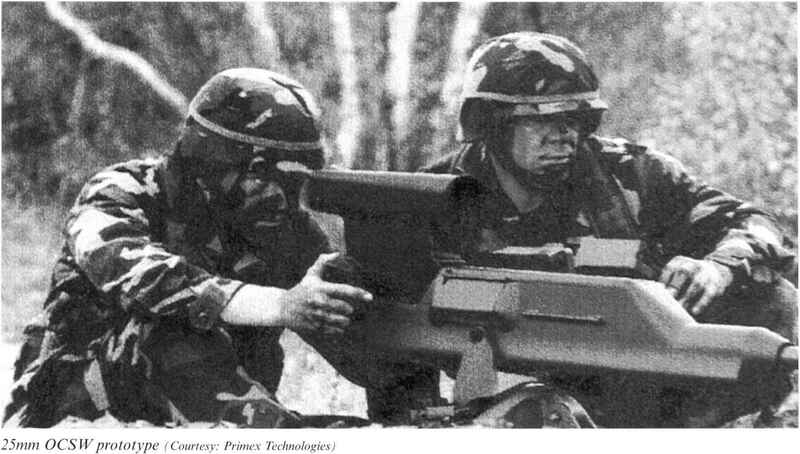 To give an example of current trends, Rheinmetall developed the Rh503 cannon for the next generation of MICVs, a project now taken on by Boeing as the Bushmaster III. Like most of the modern AFV weapons, it is externally driven, with a rate of fire variable between 150 rpm and 400 rpm, and weighs around 500kg. 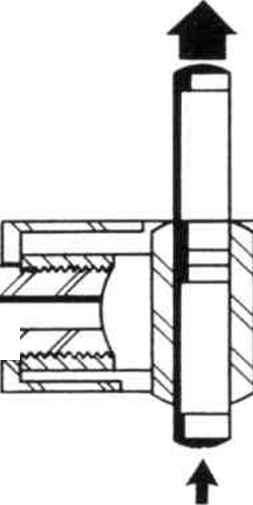 It is initially offered in 35 x 228 Oerlikon calibre, but designed to convert easily to a new 50 x 330 'Supershof cartridge which is based on the 35mm case, but has the neck expanded to the larger calibre, effectively making it entirely straight. The reason for this is that the larger the calibre of the barrel, the more power can be pushed down it. Given that the diameter of the main anti-armour projectile, the APFSDS, is unrelated to the gun calibre, it therefore makes sense to adopt as wide a calibre as possible. For the same overall length and width as the 35mm cartridge (the projectile is almost entirely buried within the case), the 50mm has 75% more muzzle energy. A very similar weapon in the same calibres is the South African EMAK 35, now offered in the LCT-35 turret. A similar approach has been adopted for the proposed 'Super Forty* version of the Bushmaster II, in which the 30 x 173 cartridge has been necked up to 40mm. This should not be confused with the much bigger 40mm Bushmaster IV, designed around the Bofors 40 x 364R ammunition. France, the UK and the USA are taking a different route to the same objective, by developing revolutionary cased telescopic ammunition (CTA) weapons. The American COM VAT and Franco-British experimental 45 M911 both use a 45 x 305 cartridge in which the projectiles are entirely contained within the lightweight case. The result is a very compact and light cartridge, optimised for APFSDS ammunition. The M911 gun can achieve 400 rpm, although 200 rpm is considered adequate for ground fighting. French and British interest has more recently focused on the slightly smaller (40 x 225) CTA 2000 weapon. A 12.7mm Gatling-type four-barrel HMG is also being developed using the CTA principle. Weighing 26kg, it is capable of 4,000 rpm. 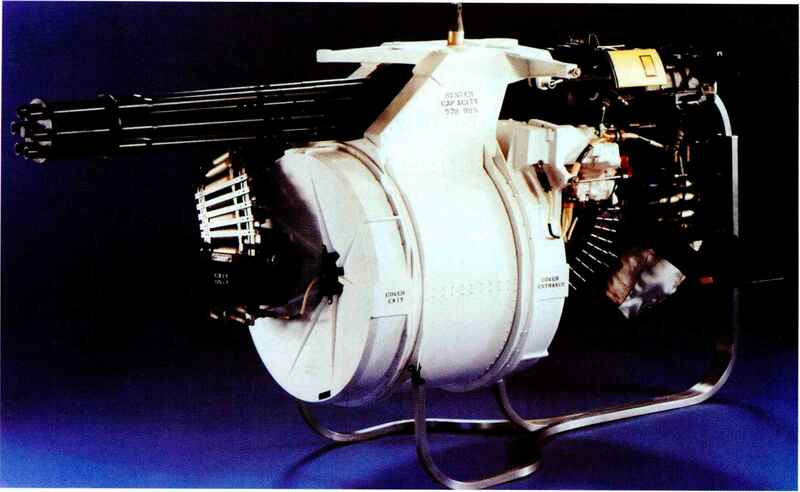 The USA has established the JMAT (joint medium-calibre automatic) programme, initially concentrating on rotary guns in 20mm and 25mm calibre - effectively a second attempt at the abortive GAU-7/A. Options for mounting AFV guns have also been affected by the development of optronics. The need to be able to fight at night and in all weathers had led to a great increase in the number of light intensifying and thermal-imaging observation and sighting systems. As these detach the gunner and commander from the need to be placed close to the gun, it is now feasible to dispense with a large and vulnerable turret. Instead, the crew can be located in the relative safety of the hull of the AFV, with only the gun mounting and optronics sensors protruding above. It is clear that the externally powered single-bar-rel gun is beginning to dominate in vehicle- or heli copter-mounted applications in which reliability, compactness and controllability are more important than a high rate of fire, albeit with strong competition from long-recoil designs. muzzle velocity, which helps to account for the current interest in liquid propellants. As with naval weapons, heavy automatic guns are not just useful in their main roles. Wartime experience has shown that they can be very effective in dealing with infantry attacks which may be too far away, or under too much cover, to be affected by small-arms fire. Infantry engagements, however, are normally more efficiently countered by using smaller, man-portable weapons. In this role the HMG, and the specialised rifles using the same ammunition, appear to have a continuing future. How to make a m911gun?